A house in Sweden and its counterpart in Finland, once disparate entities, are now inextricably linked, thanks to the creative machinations of a “yarn bomber” named Olek. 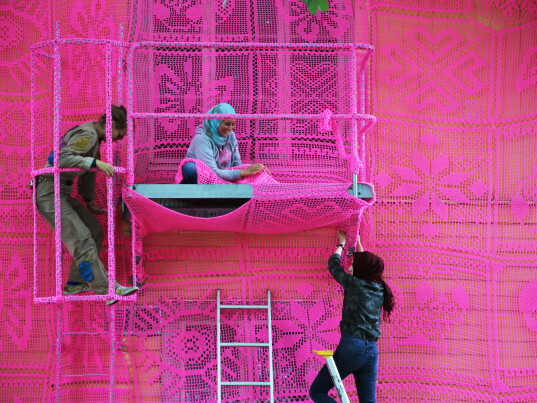 With the help of a team of Syrian and Ukrainian women, most of them refugees, the Polish artist managed to dress the facades of both manses—from the tops of their chimneys to the bases of their foundations—in vibrant pink crochet. #OurPinkHouse, parts one and two, is a symbol of a “bright future filled with hope,” along with the belief that everyone should have a home, she wrote on her Facebook page in August. Olek, whose real name is Agata Oleksiak, didn’t set out to make a political statement, at least not at first. “When I first came to Avesta [in Sweden] to install a work of art at the Verket Museum, I had originally intended to recreate a traditional home. And I did,” she said, referring to an earlier tableau, also constructed in crochet. The stories she heard from the women who assisted her prompted what would eventually become her next project. “When the Syrian and Ukrainian refugees who helped me install my piece started telling me the candid stories of their recent experiences and horrors of their home countries, I decided to blow up my crocheted house to illustrate the current unfortunate situation worldwide where hundred of thousands of people are displaced,” Oleksiak said. “We can show everybody that women can build houses, women can make homes,” Oleksiak said. Both #OurPinkHouses, she said, illustrate the power of community, and the promise of a happy ending that results when we set our differences aside to work together. And at its heart, are the women whose resilience turned it from a thought to a reality. Translation: Females are strong as hell. A house in Sweden and its counterpart in Finland, once disparate entities, are now inextricably linked, thanks to the creative machinations of a "yarn bomber" named Olek. 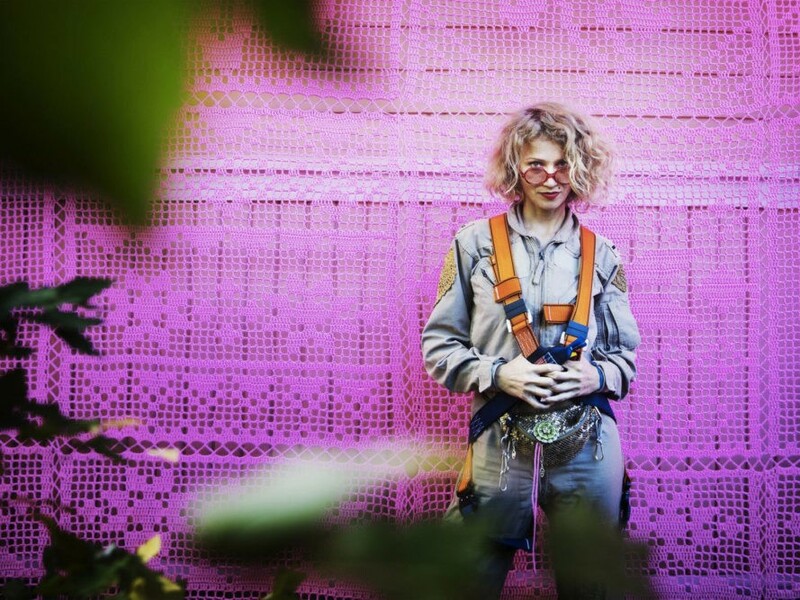 With the help of a team of Syrian and Ukrainian women, most of them refugees, the Polish artist managed to dress the facades of both manses�from the tops of their chimneys to the bases of their foundations�in vibrant pink crochet. #OurPinkHouse, parts one and two, is a symbol of a "bright future filled with hope," along with the belief that everyone should have a home, she wrote on her Facebook page in August. Olek, whose real name is Agata Oleksiak, didn't set out to make a political statement, at least not at first. "When I first came to Avesta [in Sweden] to install a work of art at the Verket Museum, I had originally intended to recreate a traditional home. And I did," she said, referring to an earlier tableau, also constructed in crochet.